Sephora Rose mask provides deep moisture and it has brightening properties. After use, skin feels and looks plumper, softer, hydrated and toned. This mask is enriched with natural Rose extract but also Aloe Vera leaf juice, Rice extract, Mushroom extract, citric acid and Broccoli -sounds yummy, isn't it ? Perfect to use for normal, dry/sensitive skin. Sephora Pomegranate mask provides fresh, radiant skin and has anti-aging benefits. After use, the skin looks awaken, toned, firm,radiant and less dull. This mask is enriched with natural pomegranate fruit extract but also Aloe Vera leaf juice, Rice extract, Mushroom extract, citric acid and Broccoli. I have the feeling that all these Sephora masks have Broccoli. Perfect to use for mature, dry, dull skin. OK, I just read somewhere that Broccoli gives a special radiance and glow to the skin. All you have to do is unfold the mask, apply it onto cleansed, dried skin/face. 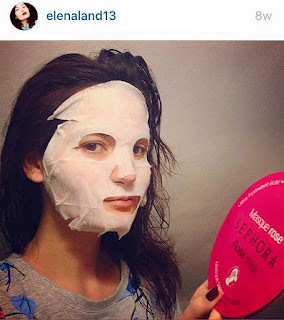 After 15 minutes, remove the mask and gently massage, allowing the excess product to penetrate the skin. No need to rinse! Next on my list to try out are the Lotus, Honey and Pearl masks. Have you tried any of the Sephora fiber masks ?